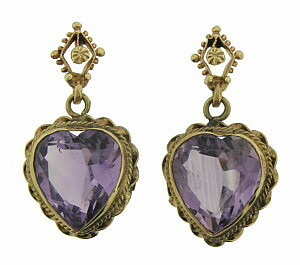 Lovely heart cut amethyst are featured in these 14K estate earrings. 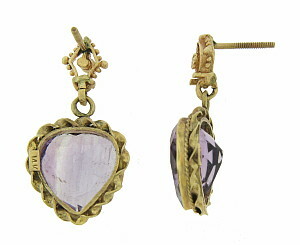 A twisting ribbon of gold surrounds the lilac hued stones. The stones are presented by diamond shaped figures outlined in milgrain decoration and set on posts. The earrings are fashioned of 14K yellow gold and measure 1 1/8"long, 5/8"wide.